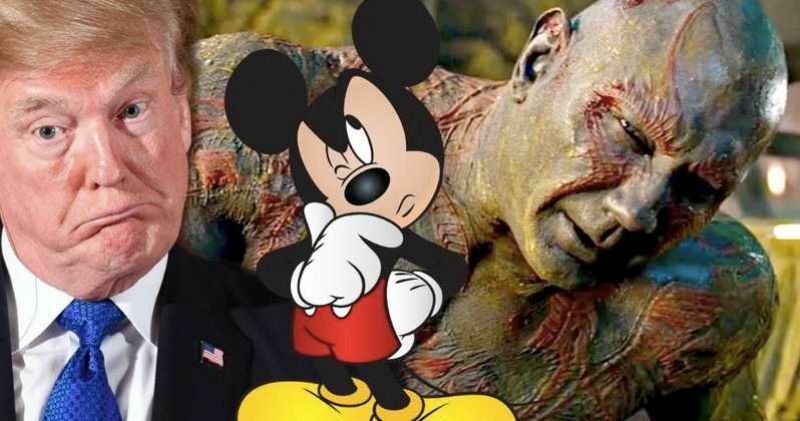 Actor Dave Bautista, one of the most prominent voices against the firing of director of James Gunn from "Guardians of the Galaxy" series, has compared Disney Studios with US President Donald Trump. Sharing a story that criticized the studio for its decision to not rehire Gunn, the 49-year-old actor made a reference to Trump's campaign and presidential slogan. "Thanks Disney!! Making America Great Again" he wrote. Wrestler-turned-actor had earlier said it will be"pretty nauseating" to work for Disney after they fired the filmmaker. "I will do what I'm legally obligated to do but @Guardians without @JamesGunn is not what I signed up for. GOTG w/o @JamesGunn just isn't GOTG. It's also pretty nauseating to work for someone who'd empower a smear campaign by fascists #cybernazis. That's just how I feel," the actor had replied to fan who asked him whether he will be ok being part of the franchise without Gunn. Disney recently reconfirmed its decision to let go of the filmmaker. Gunn was fired from directing the third film in the franchise after a series of old offensive tweets made by the filmmaker resurfaced on social media. According to Variety, Disney and Marvel are "standing by their decision to not reinstate him as helmer for the next installment.